ニッキーとの思い出やこれからの日々を、大切にしたくて作ったふたつのホームページ、どうぞご覧ください。 Here are links to two websites of me and my beloved dog. 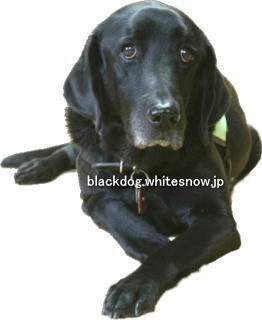 The dog is black, and my name means snow in Japanese, so the domain is "blackdog.whitesnow.jp". I am a Japanese, both mobility and visually impaired, and got a dog in 1998. In 1999, I went to the US, Arizona, and trained the dog to become my service dog under instruction by a service dog program. In 2000, my dog was certified as a service dog, and we came back to Japan. Since then, he has been working as my service dog. His name is Nicholas, usually called Nicky. Main website "Walking Together" explains Nicholas' service dog tasks with pictures, and has our diary and latest pictures. It also has educational page about service dogs. Old, but still updated website "Black Dog in AZ" had uploaded in 1999, when we were in training in the US. It has my texts and pictures about service dog training we had been in, and our days in abroad. Most of texts are now old, written in 1999 to 2000. Hope you enjoy my days and memories with a special, beloved dog Nicky.